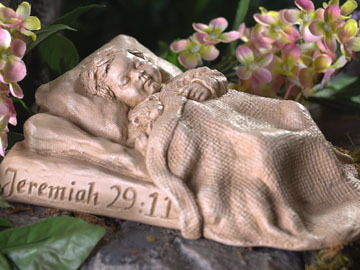 Jeremiah 29:11 "I know the plans I have for you"-God’s Word Collectibles—Inspirational gifts, cards and sculptures, a present with a scriptural message, a gift as a ministry. Home > God's Word Sculptures > Jeremiah 29:11-"I know the plans I have for you"
"Plans to prosper you and not to harm you, plans to give you hope and a future..."
Sometimes you hear a scripture and when you do, you know that though it has been in existence for years, and others may have read it before you, in your heart you know - God wrote this one for you. That's the way I feel about Jeremiah 29:11. The first time I remember hearing it was at a high school graduation. It was the class' graduation scripture. That day when I heard it I claimed the promise for myself. I was going through an incredibly difficult time. My husband had left, divorce was imminent, my daughter was six and going through her own emotional turmoil over losing her daddy. And I was trying to figure out how on earth I was going to work everything out. Could I be what my daughter needed? What about my future? Would I have to give up my direction with my sculpting? Would I make it financially? Plans to prosper, and not to harm you plans to give you hope and a future. If I could wrap up one scripture, tie it with a bow and give it to you it would most likely be this one. Let me remind you: God loves you. He wants to give you hope and a future, no matter what circumstances you are in. He has everything already figured out. There is peace in that. Hold this one dear to your heart as I have. 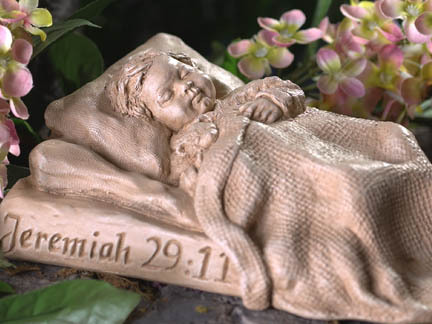 When I first thought of sculpting this piece I was going to sculpt a crying child, perhaps because it is in that state that I need the assurance that this scripture gives me. After prayer I changed it to this sleeping baby, claiming the promise that this scripture brings peace. Trust in God. This dear child sleeps peacefully knowing his dad has everything under control, he knows he will be safe, and cared for. We know this too. Our Heavenly Father has a plan. Thank you for the plan that you have for each of us. Thank you for your Word that holds such peace and strength and promise. I claim this for myself and for those who are sharing this scripture through God Word. Let them, even now; be filled with peace and assurance. When all is in turmoil, and we cannot see our way to the end of the day, I thank you that you have a plan. Help us to be open and receptive to what your desires are for our lives.